Eduardo Aparecido won the 15/15 Bucking Battle at the PFIWestern.com Invitational, presented by Bass Pro Shops, with an 89-point ride on Shelley’s Gangster. Photo: Andy Watson/BullStockMedia.com. SPRINGFIELD, Mo. – In front of a full house at JQH Arena on Saturday night, PBR’s (Professional Bull Riders) Eduardo Aparecido (Gouvelandia, Brazil) won his first 15/15 Bucking Battle of the 2018 season at The 25thPBR: Unleash The Beast, PFIWestern.com Invitational, presented by Bass Pro Shops. Aparecido, one of only two riders to record a qualified ride in the special round of competition, rode Shelley’s Gangster (Dakota Rodeo/Chad Berger/Clay Struve/Shelley Cadzow) for 89 points to hold his No. 10 spot in the world standings. For his effort, he gained 150 world points and a $11,500 paycheck. Dener Barbosa (Paulo de Faria, Brazil) was the only other rider to turn in a score in the special round with his ride aboard Smooth Over (GT Bucking Bulls/ Hart Cattle) for 86.5 points. He earned 90 world points and $9,500. The win moved the young Brazilian cowboy from the No. 12 spot in the PBR world standings to No. 11. Earlier in the evening, Derek Kolbaba (Walla Walla, Washington) delivered a round-winning 88-point ride aboard Little Texas (Talbert Bucking Bulls) to earn his fifth-round win of the season. For the win in the second round he gained 100 world points and a $3,580 paycheck and moved from No. 16 in the world standings to No. 14. 2012 PRCA World Champion Cody Teel (Kountze, Texas) finished in second-place during the Round 2 action to hold his position at No. 6 in the world standings with an 87.5-point ride on Comeback Wacked (Currey Creek/ Martinez Bucking Bulls). Teel collected 60 world points and a $2,750 paycheck. In just his second premier series event of the season, young gun Eli Miller (Statesville, North Carolina) turned in his first qualified ride aboard Real Gun(Cord McCoy/ G-G) for 87 points. For his third-place finish in Round 2 he received 50 world points and $2,000. Brazilian phenom Luciano De Castro (Gozolandia, Brazil) held onto his No. 7 spot in the world standings with a fourth-place finish. De Castro turned in an 86.5-point ride aboard Detective Crockett (Talbert Bucking Bulls) to earn 40 world points along with $1,300. Rounding out the Top 5 in Saturday’s Round 2 was Nathan Burtenshaw(Coonamble, Australia) with an 86.25-point trip aboard Heartaches & Grease (Pritchett Ranch/Melton Bull Co). Burtenshaw gained 30 world points and pocketed $850. The finish moved him up in the world standings from the No. 24 spot to No. 21. Friday and Saturday night featured both American Bucking Bull Inc. (ABBI) Big Tex Classic and Maturity events in conjunction with the PBR’s Round 1 and 2. Jokers Wild’s (01 Cattle Co/Robbie Schroeder) 90-point performance held up through two days of Classic competition for a first-place finish overall. Concealed Carry (Rockin R Bucking Bulls/Jerry Rush) posted 89.8 points for second place, while Fearless (Buck Cattle/D&H Cattle) – named Mickey D for the night – placed third with 89.4 points. Uncle Gangster (Hart Cattle/Clapp Cattle) landed fourth place with 89 points and MONAT Black(Sara McCoy/Bruce Wold) rounded out the Top 5 Classic bulls with 88.25 points. In the Maturity competition, Slinging Tears (Blake Sharp/Caverman Bucking Bulls) won more than $7,700 with a 90.4-point score, finishing in first. Smooth Wreck (Owens/Wyatt/Smith) picked up 89.2 points for $5,577.00 and second place and J.T. (Curtis Mendell) notched third place with 87.6 points for $3,432.00. Southern Style (EVP Bucking Bulls) and Wild Goose (D&H Cattle/Buck Cattle) rounded out the Top 5 with 87.4 points and 87 points, respectively. Southern Style earned $2,574.00 and Wild Goose took home $1,072.50 in winnings. An ABBI Classic competition is the next step in a young bovine’s competitive career and begins when the bull is three or four years of age. These bulls start and finish their Classic career under PBR riders. The ABBI Maturity competition was created for bulls that have “aged-out” of ABBI’s competitive formats. After a bull’s 4-year-old season, the only thing left is for him to buck at are PBR events where there is no chance at earnings any longer, aside from money he is paid to be at the event and potential bonuses for being the high-marked bull. In addition to bulls that are 5 years of age or older, other bulls that are ineligible to compete in other ABBI contests for various reasons may also compete in this format. The world’s best bull riders will return to JQH Arena for Championship Sunday, September 8 for Round 3 and the championship round of the PFIWestern.com Invitational. 1. Eduardo Aparecido, 89-89.00-150 Points. 2. Dener Barbosa, 86.5-86.50-90 Points. 1. Kaique Pacheco, 91-0-84.75-0-0-175.75-100 Points. (tie). Derek Kolbaba, 0-0-88-0-0-88.00-100 Points. 3. Cody Teel, 0-0-87.5-0-0-87.50-60 Points. (tie). 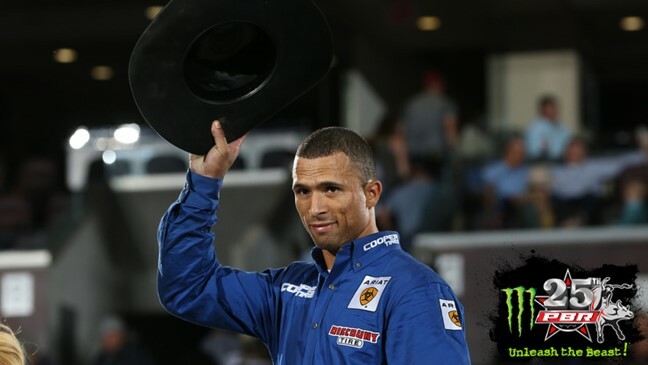 Eduardo Aparecido, 89.75-0-84-0-0-173.75-60 Points. 5. Matt Triplett, 89-0-0-0-0-89.00-50 Points. (tie). Eli Miller, 0-0-87-0-0-87.00-50 Points. 7. Luciano De Castro, 0-0-86.5-0-0-86.50-40 Points. (tie). Alisson De Souza, 86.5-0-0-0-0-86.50-40 Points. 9. Nathan Burtenshaw, 0-0-86.25-0-0-86.25-30 Points. (tie). Silvano Alves, 79-0-86-0-0-165.00-30 Points. (tie). J.B. Mauney, 86-0-0-0-0-86.00-30 Points. 12. Jess Lockwood, 70-0-0-0-0-70.00-5 Points. (tie). Dener Barbosa, 0-0-85.5-0-0-85.50-5 Points.